They're made of silicone that are perfectly safe for both cold and hot temperatures. Completely dishwasher safe and totally fun in the kitchen, hehe. They come in a few different varieties, depending on where you're shopping. 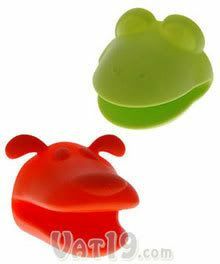 I've seen green frogs, yellow/red dogs, and blue/red hippos (at least that's kinda what it looked like, lol). What a fun gift idea!